Spacious 3BR Borrego Springs Home, Walk to Downtown, Amazing Mountain Views! This spacious 3BR/2BA home (sleeps 6) features stunning mountain views from a sprawling covered patio. Nature surrounds you, but every convenience is close at hand – walk to town, take a desert hike, go shopping or relax on the patio and enjoy the view! Enter into the open-concept, mountain-view living space. Sit down to dinner at the 10-person dining table - the mountains are your dinner’s backdrop. To the right is a living room with a huge sectional sofa with room for the whole group to sprawl out. A 55” smart TV ensures you don’t miss your favorite shows, and a set of doors leads to the patio. Terra-cotta tile extends into the kitchen. Its large galley design includes tons of prep space on butcher block counters and a double stainless sink. Everything you need is here: an electric range, side-by-side refrigerator/freezer w/ water and ice, a microwave, toaster and a Keurig coffee maker. The kitchen door makes it easy to take dinner out to the patio. Past the kitchen you’ll find the first bedroom with a full-size bed and a perfect view of the sunset. The 2nd bedroom has a full-size bed and a 32” Vizio TV, Bluetooth soundbar -- plus sliding doors to the rear patio. Across the hall, the shared bathroom includes a large, single-sink vanity with lots of storage and a tub/shower combo. The spacious master bedroom is at the end of the hall, with a queen-size bed, 40” TV and an en-suite bath with a vanity and walk-in shower. There are also double doors to the rear patio, which offers shaded space, a table that seats 6, outdoor furniture and lounges, a wet outdoor kitchen area, extra chairs and gorgeous views of the mountains. In the evening, enjoy views of the starry sky or, in the morning, have your breakfast outside before the day warms up. Hike or bike during the day -- look for Bighorn Sheep! Everything Borrego Springs has to offer is waiting for you in this comfortable home, and even offers RV Parking. Verbena Estates in Borrego Springs is a collection of standalone homes featuring large lots and end-to-end mountain views at the foot of Indian Head Mountain. All of Borrego Springs is ensconced in the 600,000-acre Anza-Borrego State Park, with its many opportunities for hiking and off-roading through wild desert beauty. 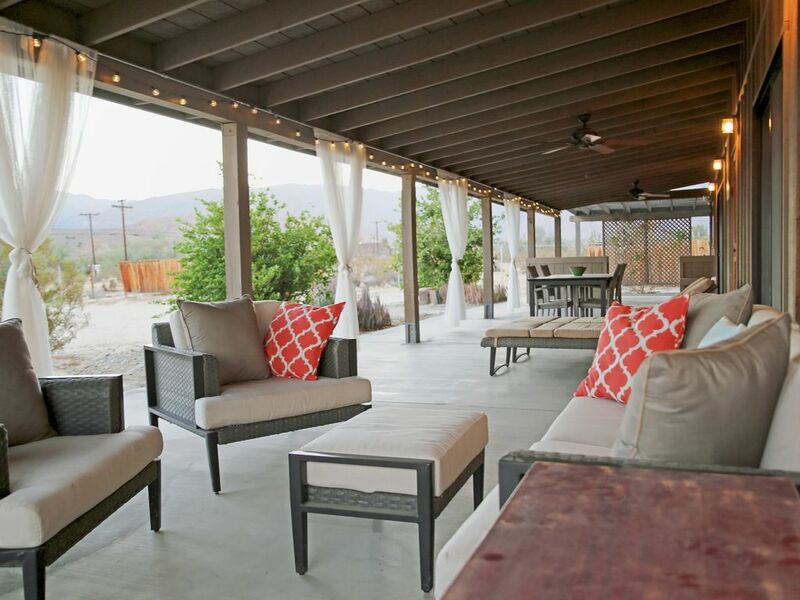 This home is located within walking distance to downtown Borrego Springs, where you can dine, shop, or join a tour to learn about the desert ecosystem or Borrego Springs history. By night, the stars find their time to shine: Borrego Springs is a member of the International Dark Sky Association and the stargazing is spectacular! Upon arrival, easily access your home with a keyless secure door code; no need for an in-person key exchange. Your rental will be professionally cleaned and ready for you to enjoy. You can expect all the comforts of a fine hotel, including shampoo, soaps, paper products, and linens. The HomeDroid tablet (an electronic guest directory) will be provided with specific home details, Wi-Fi access, and TV instructions. Owner and manager were communicative and generous. Home is very clean, very comfortable in a wonderful location. Walking distance from shops and restaurants, views of the amazing mountains. It was the perfect spot for a family weekend. Clean, comfortable home located within easy walking distance of shops and restaurants. Excellent communication and a wonderful place to stay. came out for an early glimpse into flowergeddon 2019. though the flowers were not quite available for viewing, the property weas certainly ready for prime-time. it was clean, centrally located, and exactly as depicted. though we had some issues with the internet and wi-fi (which is common in the desert), their repsonsiveness and willingness to problem-solve made this more of a minor inconvenience and not a problem. would highly recommend this to anyone (but not too much as would prefer to stay here again next time in the desert). Lovely home has everything you need for a very comfortable stay. Accurate pictures & description: open and inviting with colorful décor. Kitchen equipped with plenty of utensils, cookware, small appliances. Very clean throughout! Could not be more convenient to anything you would need in this small town, it&#x2019;s an easy walk to the restaurants, market, ice cream shop, visitor info, etc. Central to exploring Anza Borrego State Park. Loved the outdoor fire pit. Communication with the owner/manager was great &#x2013; they were responsive and accommodating! Because of its proximity to the &#x201C;main drag&#x201D; (small as it is), there is street noise, but it never bothered us or disrupted sleeping; just enough of a reminder that you are not isolated. Aside from that, the home felt totally private and provided a restful & peaceful get-away to the desert. This review is for the HOME & OWNER &#x2013; BOTH 5-STARS. Now as for TurnKey? Well, there was a &#x201C;little hiccup&#x201D;, we worked to resolve it with TurnKey, in the end we were disappointed with their service, and give TurnKey a poor score. The property was well maintained and quite functional. Brad was responsive and helpful. We had a great time. The home was nicely appointed and comfortable for 2 couples (it would also be fine for 3 couples or families). The best part about it was that it was a short walk to several restaurants and grocery stores.